Switches are an integral part of any electrical control system. As such, on an operator interface you’ll want to be sure their functions are easily identifiable and efficient. If your operator interface switches don’t align with your equipment’s application, it can increase the amount of time it takes an operator to successfully complete a task, or potentially lead to costly mistakes during operation. While they come in many different shapes, sizes and finishes, there are two main types of maintained switches you could use on an operator interface – rocker and toggle. Here’s a breakdown of how both types work and their respective pros and cons. As the name implies, a rocker switch will rock back and forth between ON and OFF with just the touch of a finger (shown above, left). The face of the switch is typically made out of plastic and can be customized with icons to indicate their function. Backlighting can also be used, whether to indicate when the switch is in the ON position or to help illuminate the operator interface. Since physical ON and OFF points are included on a rocker switch, it can take up more space on your interface than other kinds of switches. Due to the overall design, debris can build up underneath either end of the rocker switch if it is not sealed, making it difficult or even impossible to use if not properly maintained. If you choose to use a sealed rocker switch, it’s important to note that the operator interface design needs to include a sealed connector and wires. Because of these potential drawbacks, and the fact that minimal force is needed to engage the switch, rockers are typically used for interior applications, like the controls inside the cab of a refuse truck. A toggle switch has a long lever – known as the bat – that an operator can flip between OFF to ON positions (shown above, right). These kinds of switches are fairly small and usually have metal housings, making them quite durable. Further, toggle switches can be easily sealed using “boot” covers, making them popular choices for exterior or industrial applications, like the controls on an asphalt screed or military vehicle. 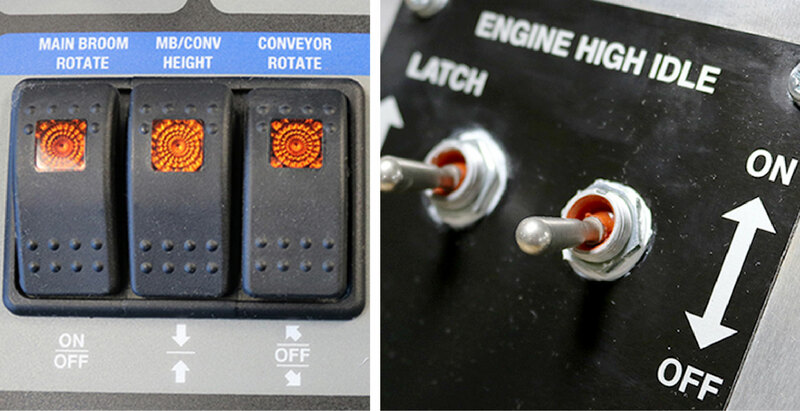 Unlike rocker switches, toggle switches mount to the operator interface from the back. This makes them ideal for designs requiring a circuit board, provided a toggle lock washer is used to keep the switch from spinning around post-installation. However, there are some limitations. Illuminated toggles must be used if lighting is desired, and the lighting feature generally cannot be customized beyond choosing the color. Further, any other labeling or lighting for the switch needs to be placed on the operator interface near the toggle. Choosing the best switch type for your application is partially a matter of knowing the pros and cons of rockers and toggles. However, before making a decision you must also factor in specifics such as the needs of the overall design, whether your operator interface is protected from or exposed to the elements, and the conditions of the working environment. Heavy duty equipment can present unique challenges, which are detailed in our case study, What We’ve Learned from Building Electrical & Mechanical Assemblies for 10,000+ Military Vehicles. Click the button below to access your copy now.